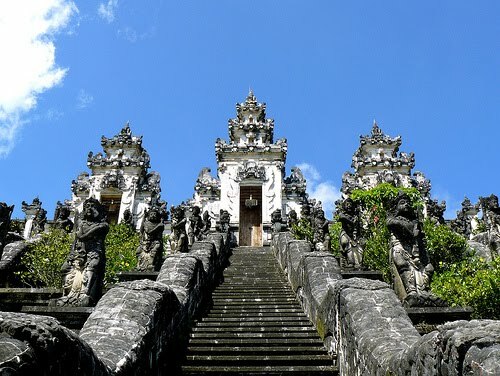 Pura Lempuyang Luhur, located at the summit of Mount Bisbis, District of Abang, Karangasem regency or about 92 km from Denpasar City. Pura Luhur Lempuyang glorified as stana Agnijaya or Dewa Hyang Iswara.There is no historical record of when exactly was founded Pura Lempuyang. There are sources who say they have stood since the first century AD, or the 10th century AD. History Pura Lempuyang closely related to the arrival of MPU Kuturan in Bali. MPU Kuturan lot to teach about ways to manufacture and arrangement parahyangan, including Pura Lempuyang. Based on this conclusion, Pura Lempuyang existed since the 10th century AD during the reign of King Marakata in Bali. Inscription mentioning Sading Village, at saka year 1072 or in 1150 BC, King Jayasakti from Java came to Bali with his empress and 400 of his followers to do semadhi and dharma in the temple area Lempuyang. Piodalan Pura Luhur Lempuyang Sweet Day falls on every Galungan or exactly on the day Wrespati Umanis Dungulan wara.Pengempon temple of manners (residents) Purwayu Pakraman Village, Tista Village, Kecamatan Abang, Karangasem. taman yang begitu asri, semoga tetap terjaga keasriannya.